Ask Me Anything: Do Clothes Make The Man? Do clothes still make the man? 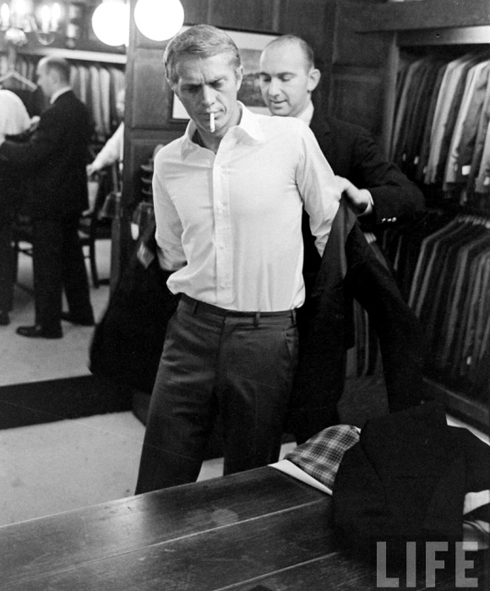 If so, in your opinion what single item of clothing most typifies the modern gentleman? My dear, what a lovely question you’ve posed! As you have probably gathered, I am a woman who has a deep appreciation for menswear. Throughout my life, I have found myself surrounded by men who have taken a particular interest in their personal style — albeit widely varied in taste and approach. I always tend to fancy a bit of a dandy, so it should come as no surprise that I have known and loved my fair share of peacocks, my father being the first, and the progenitor of this inclination. Cherie, I feel uniquely positioned to answer this question for you. My point of view on menswear is that of a lady who eyes your wardrobe appreciatively, with an eye on what I might squirrel away for my own. However, in order to round out the conversation, I’ve also asked a few of my nearest and dearest to also chime in to see if we can’t make this a more well-rounded conversation. I feel, to a certain extent, yes, the clothes make the man. A simple example would be the face value effect. Two men show up for a job interview for the same position. One man in a ripped t-shirt, baggy shorts, and flip-flops, while the other man is dressed to the nines in a suit and tie. Based on appearance alone, 9 times out of 10, the man in the suit will be given priority regardless of character. This also depends heavily on where the interview is. But in this instance, the clothes made the man. They made him appear readier and more willing and able to do the job. Sure, the guy could turn out to be a psychopath that ends up going nuts with an uzi after being let go for not meeting quarterly quota, but the fact is, he got the job. But what of the man in the shorts? Well let’s be honest: If he showed up to a job interview where the heads of the company smile on suits, he probably wasn’t too serious about the gig. But had the same scene gone down at an REI or an outdoors-enthusiast spot, the tables might have been turned. We’re a shallow society. A generalization, sure, but it’s much easier to judge someone by appearance first and character second. So aiming to please visually is natural. Plus when you think you look good, you feel good. So, to make a long story a bit longer, the clothes make the man, but the man makes the choice. So, you really make yourself. In terms of one single item that is typical of the modern gentleman, I would say a classic and well-built leather wallet is a must. The single item that typifies the modern gentleman for me is becoming cliched these days, as more and more young men are improving their standard of dress. However, if I had to boil the argument down to a single item, I still believe a pair of dark brown or walnut-colored wingtips in calf or cordovan is the item the modern man cannot do without. Yes, captoes are more formal and a navy blazer is arguably the foundation of a wardrobe, but the wingtip deserves much praise for its versatility, as it can be paired with anything from a suit to a cardigan to a t-shirt. There are also a variety of styles within the wingtip family (longwings, shortwings, oxfords, and derbies), allowing a man to still show some individuality and personal preference with his choice. And as I continue to see gents walking around in black, laceless, square-toed dress shoes, I don’t think the point that “the shoes make the man” can be emphasized enough. While I would still say that fit is the single most important element a modern gent should focus on, I believe that a nice pair of shoes are the one item that should not be marginalized. I for one will pay up for quality materials and superior construction, as I intend to enjoy and hold on to the pairs I buy for more than a few years. I don’t think clothing was the only thing that ever made the man. It comes down to many other things, not least of which is passion, personality and drive. That said, I think clothing is an integral part of expressing all of the above. Some might point to the suit as the single most manly type of clothing, but I’d say it actually just comes down to the shoes. My grandmother once said, “you can see a whole man through what he chooses to put on his feet”, and I’ve never forgotten this. Shoes, and all of the considerations that go into them, are a very personal and functional item. Beautiful shoes, no matter if they’re sneakers, work boots or wingtips can tell you where a man wants to go, and how dedicated he is to getting there. Invest in a good pair that fits your lifestyle and you better believe it will pay off. The ladies, they notice these things, take our word for it. To be honest, I didn’t start caring about clothes or the way I dressed until a couple of years out of college. My first job was at a record label and I wore jeans and a polo to work every single day. I could never get used to the idea of wearing a t-shirt, flip flops, and shorts to work like many of my co-workers. It just didn’t feel right, so I figured jeans and a collared shirt would be somewhere in the middle. If I would wear nice shoes and sport coat to work, someone would inevitably ask me who died. In the south, southern frat style dominates men in their 20’s. If you go to a southern school you are issued a pair of patagonia standup shorts, a frat t-shirt, croakies, and rainbow flip flops. One night when I was out in downtown Nashville, I looked around and noticed every dude was dressed the same. It drove me nuts. How are you supposed to stand out if you look exactly like the guy next to you? It was then that I realized it’s time to start paying more attention to the way I dress, so I cleaned out my closet and got rid of everything I had purchased from the time I graduated high school to that point. I invested in some nice suits, shoes, and dress shirts. I retired my baggy jeans and bought a pair that fit. I also started to take notice of the way other people dressed. What I’m trying to say with this back story is that clothes still make the man. I think men pretend not to notice what other men are wearing, but the truth is they do. To me the item of clothing that most-typifies the modern gentleman is his shoes. I’m not scared to save and spend money on shoes. You can make a cheap suit look good by finding a great tailor, but you can’t hide a cheap pair of shoes. I believe that a man is a sum of so many different parts: respect, strength, self-confidence, gallantry, curiosity, bravery, love. Taking pride in one’s appearance is undoubtedly one of these elements, so thus, if someone’s got everything else under control and then adds some great clothes to the mix, then it could be said that clothes “made” (or completed) that man. Conversely, if you’re a jackass, but dress well, you’re still just another jackass in bespoke. Other things that will catch my eye will be the glasses and tie you might be wearing (and I hope you’re wearing both, but that’s just personal preference), the fit of your clothes and your choice of socks (or better yet, lack thereof). But above all, there is one small item that I believe speaks volumes about you — at least to me, anyway. It’s your watch. In my opinion, the wristwatch most typifies the modern gentleman. A man’s choice of timepiece will speak loudly to me. I’ll first note the style, then after a bit I might try to gauge up the age and price you probably paid, and then I will take a step back and try to figure out why you chose that particular watch — what is it about this watch that drew you to it? What are you trying to say about yourself by choosing it? I’ve mentioned it a few times already, but I frequently wear one of my father’s watches that doesn’t work. I’ve always preferred to wear men’s watches because I have a sizable disdain for dainty twee lady watches. I want something handsome and substantial on my wrist, just like I like my men. I clearly remember the first watch I specifically asked for, when I was 8. It was a large, men’s Timex with a round, white face and a dark brown braided strap. The strap was so long on my 8 year-old girl’s wrist that I had to loop the strap back under itself to deal with all the extra slack. I also took to wearing it on my right hand, even though I was right-handed — something I continue to do to this day. The point here is that I’ll be wondering about the story behind your watch of choice. In my life, I’ve known a few watches (and their owners). There was the refined gent who alternated wearing a dazzling Chopard — that I frequently joked cost more than my first car — with a cheapie plastic Timex Ironman because he loved to swim and run. He tended to wear the Ironman more, even with his fine suits. So much so that I sometimes had to remind him it was “big boy watch time.” There was the upstart who wore the diamonds in his bezel with so much swag, it became tiresome. There was the handsome executive/repressed creative who favored switching the bands on his antique field watches so that a flash of Hermes orange would peek out of his cuff at board (bored) meetings, unexpectedly. I don’t design to tell you what kind of watch you should be wearing. Aim for something that pleases your eye and is appropriate for your wallet. You should be wearing the kind of watch you like. 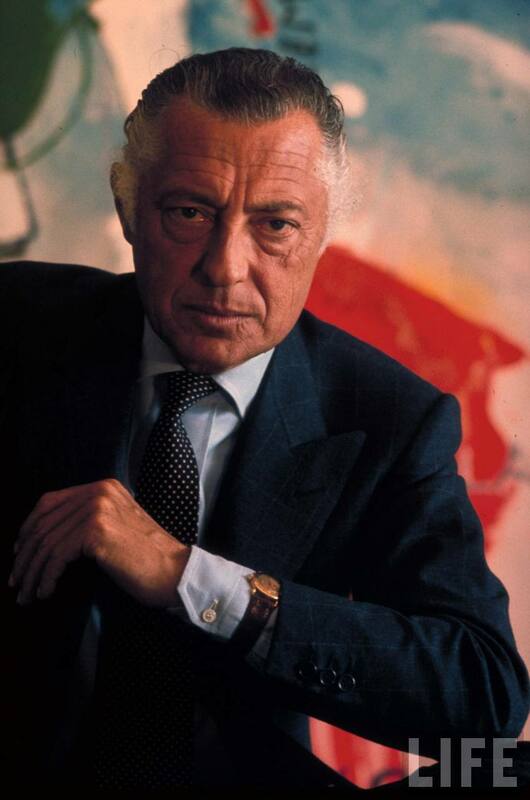 You should also wear it in the manner you like, just like Gianni Agnelli above. But rest assured, I’ll notice whatever you’ve got on your wrist, and I’ll want to hear all about it. You are currently reading Ask Me Anything: Do Clothes Make The Man? at Quite Continental.